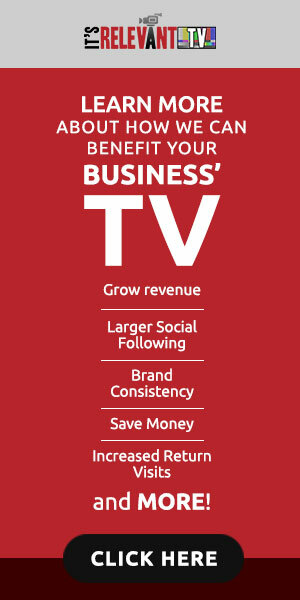 What’s on Your Business TV? Televisions are becoming a fixture in businesses throughout the United States. While many business owners have decided to buy TVs, not many put much thought into what is displayed on them. TVs can help visitors pass the time but they can also draw customers away from you, and to competing businesses and products. It’s Relevant TV blocks out all competitive ads from your television. In a car dealership, you will never see another car dealership message on your screen. In a restaurant, It’s Relevant TV will not show any other dining establishments. IRTV’s proprietary technology takes care of the blocking automatically and infuses your TV with more relevant TV programming in place of lengthy ad breaks. It’s Relevant TV shuts off ads that could be harmful to your business, while reducing the number of overall ads significantly to make your customers happier viewers. The average hour of cable television includes between 16 and 22 minutes of advertisements. It’s Relevant TV limits ads to 3 minutes, making sure that the focus of the television is on the satisfaction of your customers. You can learn more about the differences between cable TV and It’s Relevant TV on the official site. Imagine you are sitting in a Ford Dealership getting your car serviced. You may be waiting a few hours and have a TV in front of you. The television, like many, is tuned to a local news station. In the time you are there you will not only see the TV programming that the channel offers, but also countless ads for other car dealerships. Chevy, Kia, Hyundai, Honda, Toyota, Mazda… all appearing on the screen as you wait. Catchy Ads showing happy customers, great lease specials, low financing rates, credit guarantees– all much more attractive than the car you are waiting to get back. This is a real problem for the business. As you certainly know, cars are big ticket items. They are generally the second largest purchases people make in their lives. If only one or two people in the service center are pulled towards another brand over the course of a year, the negative impact on the dealership is in the thousands of dollars. Now imagine you are in a restaurant eating your meal. On the TV, you see an ad for a competing establishment offering great prices and appetizing food. While the ad may not keep you from your current purchase, it could very well give you an alternative idea for your next meal, instead of coming back to the restaurant you are in. As silly as the quick video we prepared above may seem, the effect is very real. Regular TV exposes customers to competitors when they are most impressionable. As a business owner, you would never welcome a competitor to walk in at your business location to hand out their coupons, offer better deals, or speak directly to your customers. So why allow it to happen through your TV? The answer is simple: Up until now there wasn’t much of a choice. If you wanted to entertain customers with your TV you had to deal with the ads. But with It’s Relevant TV‘s Competitive Ad Block®, you block the competing ads, and keep great TV programming. Recent news has broken about the inaccurate reporting of video playback times on the Facebook platform. Facebook’s reporting suggested higher message playback than actually happened. In a post on the Facebook advertising help site, Facebook announced the discrepancy and explained the difference between how it defined the statistic, and what was actually measured. We had previously defined the Average Duration of Video Viewed as “total time spent watching a video divided by the total number of people who have played the video.” But we erroneously had calculated the Average Duration of Video Viewed as “the total time spent watching a video divided by only the number of people who have viewed a video for three or more seconds. Video Average Watch Time: the total watch time for your video, divided by the total number of video plays. This includes plays that start automatically and on click. This will replace the Average Duration of Video Viewed metric. Video Percentage Watched: reflects the percentage of your video somebody watches per session, averaged across all sessions of your video where the video auto-played or was clicked to play. This will replace the Average % Video Viewed metric. What does this mean for you as an advertiser? It means that if you advertised on Facebook over the past couple of years you have likely been misled. You likely have an unrealistic ROI measure if you were using the “average duration of video views” metric. Most noteworthy is that Facebook is never aiming for a 100% playback of your video. The platform operates with distracted individuals in mind and is not the place to deliver a real ad message. Instead of playing back fractions of your video ads to viewers that may be largely irrelevant to your messaging, you could be utilizing It’s Relevant TV’s Advertising Platform. It’s Relevant TV puts your video messages on television in public places and only charges you for FULL PLAYBACKS. The price is about 1/100 of what standard TV ads cost. Advertisers can target by geographic location and business type. For more information you can call the toll free office line: (855) ITS-RELE or visit online at: http://www.itsrelevant.com/advertising.